Treat yourself to ultra-clear sound and remarkable stereo effects with the Bose Acoustimass 5 Series II speaker system. You will enjoy live concert music with such clarity and vibrance that you'll feel you're actually there, thanks to the reflecting speaker technology and the Acoustimass bass module that offers balanced bass effect throughout the listening area. The automatic protection circuitry safeguards its speaker drivers from damage and helps give this system a long, productive lifespan. Compatible with amplifiers or receivers rated from 10 watts to 200 watts per channel, each speaker sports a sleek black finish and compact footprint that blends well with any home theater system and fits easily into even limited spaces. Product was actually Bose Acoustimass 5 III Speakers! 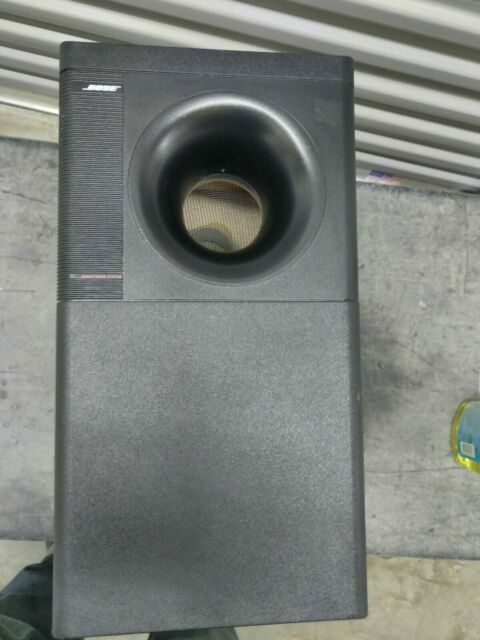 I read alot of reviews that put bose speakers in the class of over priced garbage. I suppose if you have thousands of dollars to spend on speakers that may be the case, but I unfortunatley don't. I have two Bose 301s paired with this acoustimass powered by a 5.1 sony reciever and it sounds amazing. The woofer puts out a really clean crisp sound, although its not room shaking......you should go for a powered sub if your looking for that, but none the less this is a great addition to my system. In the two days I have had it I have put it through the paces playing a variety of music very loudly and it has performed beautifuly! Fabulous sound with a small footprint. I loved my Bose Accoustimass 5 Series II speakers many years ago when purchased new....but since the base module mysteriously went missing during one of my many moves, I've not been able to enjoy that full sound. Reunited again, and the sound is every bit as full as I ever remembered. Having owned other Bose speakers, and the the original of this series, it is always amazing to hear such quality sound from such a small package. I am sold on Bose for life.